I bought this watch as a gift for my husband, I have the ‘Mini Bradshaw’ and he’s been wanting this one for a while. I got a great deal and it is beautiful! 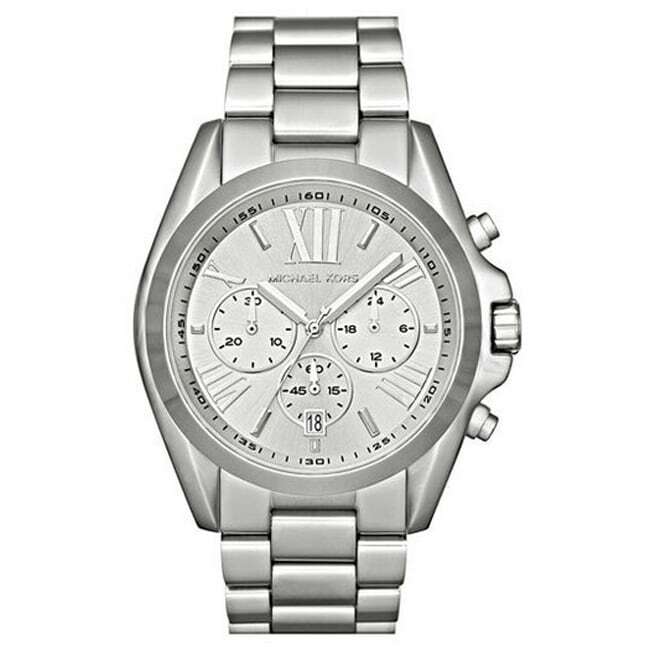 This Michael Kors watch features a Roman numeral accented dial and a stainless steel bezel. Multiple subdials and a stainless steel bracelet finish this stunning timepiece. The picture really doesn’t do this watch Justice... and I’m not a big fan of silver. I selected this watch because I thought it would be a classic watch that I could wear with silver bangles or bracelets, and it is just that! I thought I’m hoping this watch will stand the test of time like my other MK watches...I do have to get the watch sized which is not a problem but is an added cost but overall I am pleased with the quality, look, and style. I would highly recommend this watch to everyone! It comes in a nice case, and is very beautiful. The watch is made with great quality and detail. It would make a great gift for someone or even for yourself. The picture doesn’t do the watch justice. 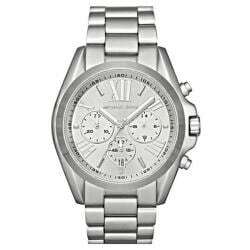 I am always buying watches off of overstock and I have never been disappointed with any of them. This watch, however is absolutely gorgeous. It is great for casual or even dress. If you like larger watches, this one is great. The watch is like a boyfriend style watch, which means it is a bigger style. It looks classy and stylish. I am not disappointed with this purchase at all! I don’t think anyone, whom purchases this watch will be, disappointed. Very pleased with this purchase and again, I highly recommend this watch! I thought I was buying a womens watch as this was listed under womens. Turns out it was a mens watch. I will be returning. My daughter loved the watch for her Birthday. "I want this exact watch in gold, do you think you will get it in?" Unfortunately we are unable to know at this time if or when an item will be in stock.